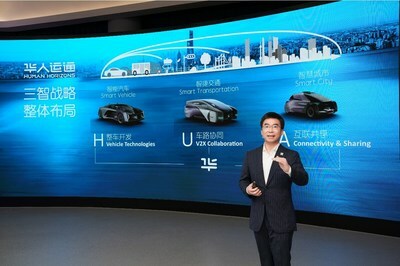 SHANGHAI, April 2, 2019 /PRNewswire/ -- Human Horizons officially announced its strategy for smart vehicles today. Under its "3-Smart" strategy covering "smart vehicles, smart transportation and smart cities", Human Horizons will build new-era vehicle species on three dimensions: "H-Vehicle Technologies, U-V2X Collaboration and A-Connectivity & Sharing." 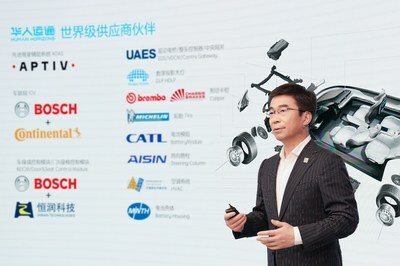 Human Horizons' founder and Chairman Ding Lei revealed that the company will announce its automotive products this summer and will also provide a preview of its first production ready model. At today's event, the company unveiled information about its industry-leading team, world-class partners, and manufacturing factories. Vehicle development is well on track and the first model will realise mass production by the end of 2020. H -- Vehicle Technologies: Bringing together cutting-edge technologies to build state-of-the-art vehicle systems to keep abreast of the times, including developing specific physical architectures, data-oriented smart EE architectures, and future-oriented powertrain technologies. In addition the unique development of active and passive vehicle safety systems providing the vehicle with a "sixth sense." U -- V2X Collaboration: Connecting the vehicle-road data channel through V2X technologies providing the complete realisation of autonomous driving technologies to enable passengers to enjoy the pleasure of travel to the fullest. It includes high-bandwidth and short-distance communication, data analytics, road monitoring and sensing, as well as intelligent autonomous driving technology. To create a mobile private space for the future, an immersive cabin system, and an ultimate time-tunnel experience with simulated space and time greatly enhancing the travel experience. A -- Connectivity & Sharing: Building diverse mobility carriers for cities that run on the combination of the smart city's Internet, IoT, and energy network nodes. Based on 5G, IOV and other technologies, Human Horizons will build diverse mobility carriers to suit different transportation scenarios. Human Horizons' international team consists of over 700 members representing seven countries with backgrounds in various industries such as Internet, AI, vehicle engineering, and parts manufacturing. They are former executives of leading international companies, IoV and autonomous driving experts, top vehicle development engineers and leading international vehicle designers. More than half hold a Ph.D. or Master's Degree. The Human Horizons International Science & Technology Advisory Committee which is chaired by the Academic C.C. Chan who is regarded as the "Father of EVs in Asia", brings together top scientists from around the world to form a powerful think-tank for Human Horizons to bring its "3-Smart" strategy to life." In addition to the existing R&D center, operation center and design center, the Human Horizons Jinqiao Intelligent Manufacturing Center will be inaugurated in May 2019. Human Horizons is partnering with distinguished suppliers such as Bosch, Continental, Aptiv, Aisin Seiki, Yanfeng Group, CATL, Dow, Dassault, and Siemens. Early-stage product development has been completed and will soon enter the "two-winter & two-summer" prototype vehicle testing stage. The first clay model has already completed phase one of wind tunnel testing. Human Horizons has two plans to build a smart factory: building a new one or renovating an existing facility. Either will be operated by Human Horizons' management team and factory workers, and will manufacture products using Human Horizons' technologies. In the 18 months since it was founded, Human Horizons has already achieved remarkable results under its "3-Smart" strategy including autonomous driving featuring V2X technologies, a pilot smart road project on an urban road and the in-wheel electric motor demonstrator. This summer, Human Horizons will provide a preview of its first production ready model, which is expected to cause quite a stir.